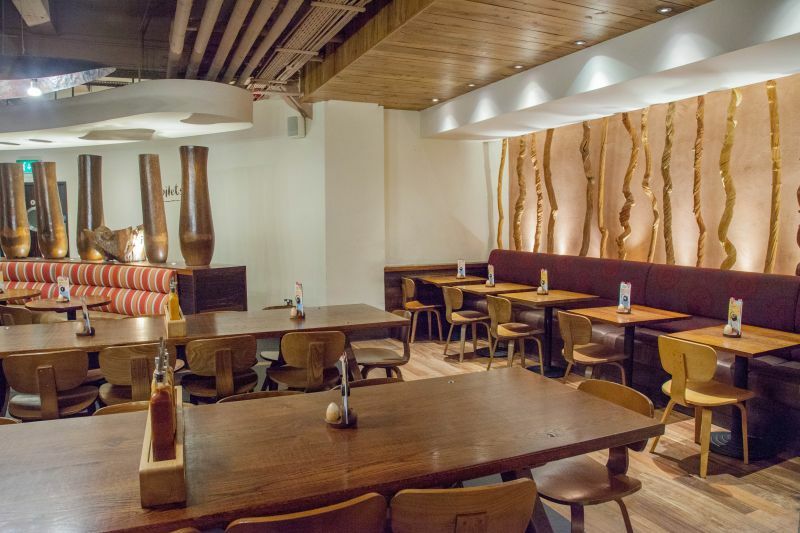 There is a chain of restaurants in the UK, and now in a few states in the US, that we love. It is “fast food” and it hails from South Africa. It is called Nando’s. The menu and concept are simple; they serve grilled chicken with a peri-peri glaze on it at all different spice levels. This cuisine is originally from Algarve in the South of Portugal, but the peri-peri spice was founded in South Africa. They have a very cute origin story on their website if you are interested. For those of you in the US who have been to a El Pollo Loco, it is a similar idea. But here is where the similarity ends. 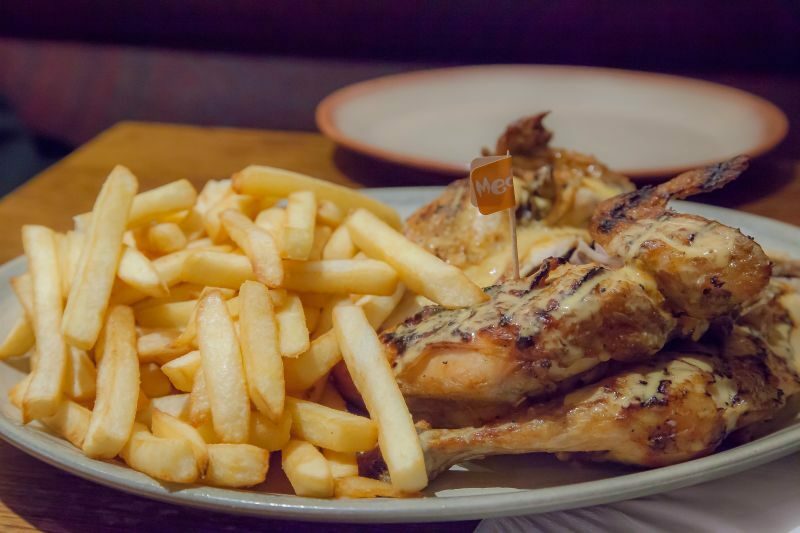 At Nando’s, you feel as though you are dining, rather than shoving food in your face to satisfy your hunger. 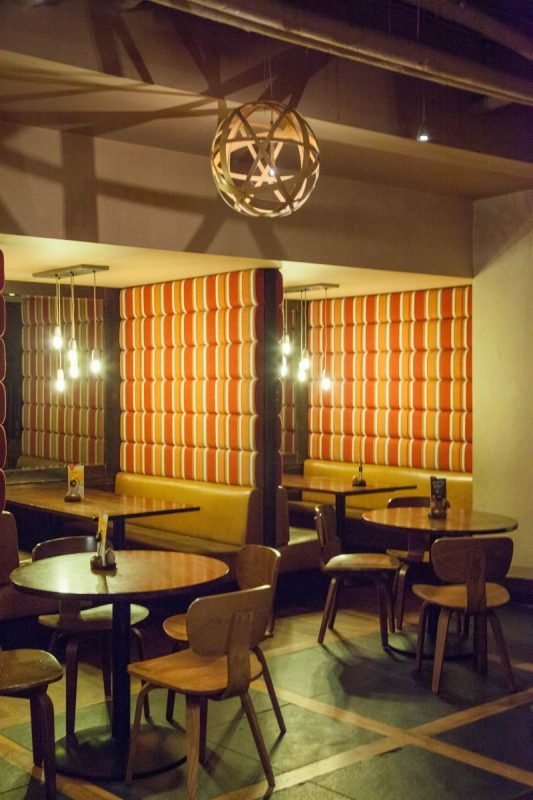 The restaurants are decorated in clear South African chic style. The South African and Portuguese blended cultures in this business just goes to show just how global our world truly is when it comes to food and wine. Going through the menu is pretty simple. They sell chicken in portions for one person or a family. They also sell salads, and sandwiches, but really what to expect with your meal is chicken, fries, and salad. I think I am safe to say that is the backbone of their menu. Or should I have said chicken bone? (Ok, bad joke there.) They have added to their menu since we were regular patrons; sides of healthy veggies and not so healthy veggies. They all look great, but I guess you get into habits at places and we didn’t order any to test them out. The Brit skips the salad and sides altogether and just gets extra fries. When your food comes out your chicken has a little flag on it letting you know its spice level. This is helpful as a warning in case you get someone else’s meal and you take a bite of something that will blow your head off because it’s so spicy. Or, on the other hand being disappointed that your chicken is too, well, mild. I would say bland, but there is nothing about this food that could be considered bland. Even their mildest zesty lemon marinade is packed with flavor. For those of you who read this blog and know my aversion to overcooked chicken, I am going to say this place does it right about 85% of the time. The few times it has been cooked to death I have sent it back to get it redone. For the most part they do a great job. The salads have always impressed with the how tasty they are. 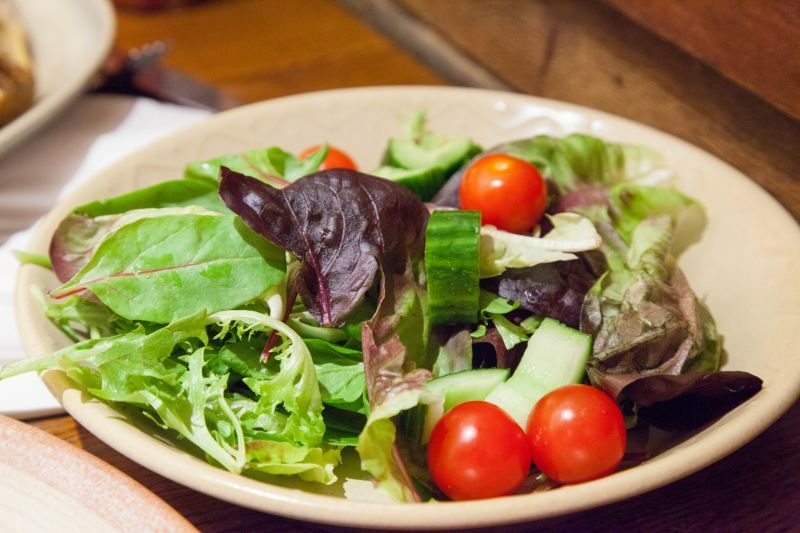 They are fairly basic, but at least it all tastes fresh and looks very appetizing as opposed to other fast food salads which taste like they have been stuck in a bag and washed with chemicals. The only dessert of theirs I have tried is the raspberry cheesecake. 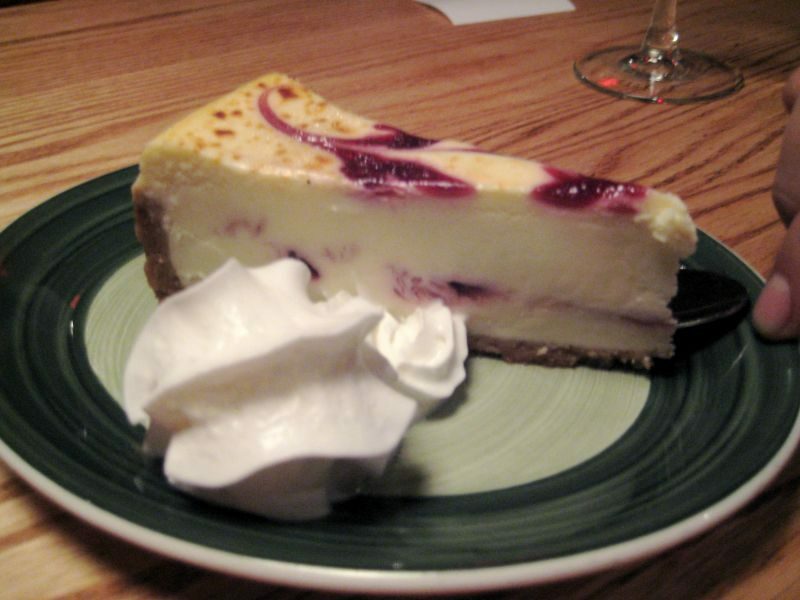 The Brit loves cheesecake so in the absence of ice cream, this is always the go to. For something that is so mass made, it had good texture and creaminess, it just missed out as the raspberry part tasted very fake. As for value, we were both able to eat a nice healthy meal for under £20. I think that is very good value. The Brit comments: This was our first meal out on our trip to the UK. Nothing says welcome back to England like eating a Portuguese dish in a South African restaurant. I always experience a slight pang of regret when I eat at Nando’s. Back in the late-eighties I lived and worked in Portugal. A colleague and I talked several times about how chicken piri-piri (An alternative spelling) would work so well as fast food in the UK. Talk is cheap and we never followed through with the idea. The success of the chain, shows that we were right about it being a good idea. They do have Nando’s here in the US now. Check out their website and see if there is one near you (Unfortunately not in California yet). They are on our recommended list.